The uranium device would be a tube in which 2 chunks of enriched uranium would be launched at each other at high speed by conventional explosives, causing a critical mass to form in the blink of an eye, triggering a nuclear blast. This type of weapon is often referred to as the “gun” type. 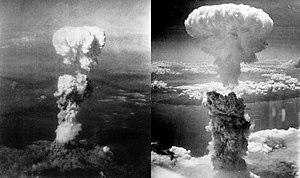 The plutonium device would be a hollow ball of plutonium with precision explosives around the outside meticulously timed to blow up all at the same time causing the hollow sphere to implode, creating a critical mass in a fraction of a second and subsequently the desired nuclear blast, what is known as an “implosion” device. 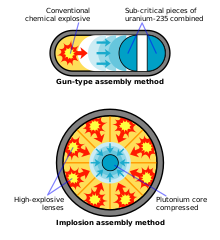 Schematic of the gun-type method (above) and the implosion-type method (below). At 5:30 am on July 16, 1945, the entire point of the Manhattan Project was on the line as a plutonium implosion device suspended 100 feet above the desert was exploded. Although the nuclear physicists on the project were reasonably confident of their calculations, no one knew for sure how big the blast would be and whether or not the atmosphere would become part of the chain reaction, ending mankind. When the brilliant fireball and mighty blast went off, the equivalent of 20,000 tons of TNT, it left a 250 feet wide crater in the desert (with sand fused to glass), a mushroom cloud 7 ½ miles high, and the blast could be felt 100 miles away. People as far away as El Paso could hear the explosion.